Gingivitis in cats, or stomatitis, is one of the most common problems people contact me about. It is very badly managed by the veterinary industry. It is a really common problem, but a really elusive one too. So I want to take you through the process of why it happens and how you can reverse it. As well as how you can prevent it. However, it does take quite a big change in your thinking, so you may not like the reasoning. Your friends and family may not like it, either. And your vet certainly won’t. Changing old habits can take time, too. But we can learn a great deal from our wonderful animal companions. In fact, it was a problematic issue one of my cats had that has lead me down this path. And I so appreciate what she offered me as I have learned so much, which has helped me and mine, and I have been able to help so many others. Gingivitis in cats is an inflammation of the mouth, the gums, the mucous membranes, just as is stomatitis. It is a degenerative disease, which means it will continue to worsen without a change of action. It is an autoimmune disease. Mostly the progression is slow. The mucous membranes are red, swollen, they may bleed. There is a foul smell to the mouth. There can be mouth lesions. The first signs you may notice is a reluctance to eat. The inflammation causes pain on contact, so eating becomes very painful. The gums loosen their grip on the teeth, so they too cause pain. The veterinary solutions are antibiotics, steroids and finally teeth extraction, often full mouth. None of this deals with the cause, so benefits are short lived at best. 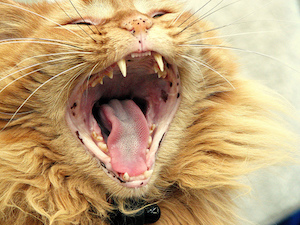 What is The Cause of Gingivitis in Cats, or Stomatitis? Whenever you have a problematic health issue, it’s always a good idea to go back to basics. If wild cats had this problem, they wouldn’t live very long. Yet wild cats, of any size, are successful where they have undisturbed (by man) habitat. 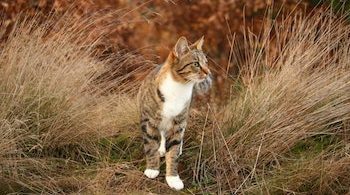 If wild cats don’t get the problem, what is the difference between them and domestic cats lives? Wild cats hunt small animals and eat them whole, crunching up on the small bones, consuming all the organs and muscle meat, along with everything else. Normally, nothing is wasted although the fur or feathers may be vomited back up. 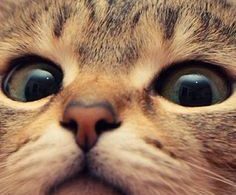 Domestic cats eat kibble or canned food, for the most part. Have you ever looked at the ingredients on the packet? The main ingredients are, almost always, some form of plant protein that has been processed to isolate it. What follows may be a little animal protein of questionable origin and quality, and a long list of unpronounceable and odd sounding ingredients you probably haven’t ever hear of. Why would someone want to give plant based food to a carnivore? Odd sounding ingredients are almost always chemicals or synthetic copycats of the real nutrients. The whole mix is cooked at high temperatures, which kills enzymes and alters protein, at the very least. It is unlikely that the ingredients are fresh or the quality is good as there are little to no standards in pet food. Does that sound appetising, nutritious or healthy? Interestingly, zoos feed their cats the same diet they would eat in the wild. Why? Because they found they fare best on their natural diet. Their health is better. And zoos are very focused on getting the best bang for their buck. They are not interested in wasting money on vet bills. They want their animals to live long, healthy lives. It is a sad reflection of where we, as a species, are in our thinking. Humanity seems to worship the current medical system as a form of religion. Nothing is ever questioned. Everyone bows to the title of Dr. Yet vets, and doctors alike, are trained, to a large extent, by the drug companies. They do need to be more eclectic. To carry a respectable title, you need to be focused on caring for your patient, offering them whatever is available that they can benefit from. All veterinary medications are patented. You can’t patent a natural product. This means the drugs and vaccines are going to be synthetic, a poor copycat of the original or a chemical composition that is unique to that company. These do little to support health, and destroy the immune system. The immune system is king in keeping anyone healthy. Those of wild animals are in good shape. Those of domestic cats are, for the most part, in poor shape. Veterinary medicine does nothing to improve it, despite the belief of those receiving it. 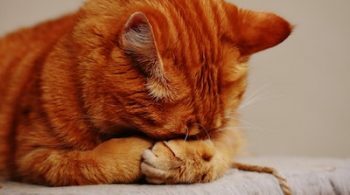 When the immune system is functioning as it should, gingivitis in cats, or stomatitis, or anything else, cannot emerge. To keep it functioning as it should, the right diet is needed. It’s only the right diet that supports a healthy immune system, by providing the right nutrition. What’s the right diet? The one the being evolved on. In the case of cats, it’s the equivalent to eating a few mice a day. Simply by addressing the diet, which may or may not be straightforward, it is possible to reverse this condition completely when it is in its early stages. It will help the advanced stages, too, although extra help is more often needed, in addition. Cats fed a quality, natural, balanced diet will rarely get any disease, let alone the chronic, degenerative, autoimmune diseases that are currently so common. The extra help that is often needed to fully and completely reverse gingivitis in cats is good homeopathic treatment. 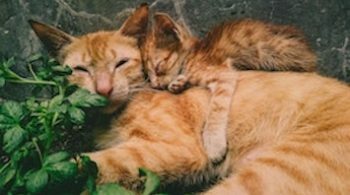 Gingivitis or stomatitis in cats that need this level of help are most likely to fully recover with this specialist form of treatment. You also need to be patient, so it’s a good idea to use a professional homeopath or homeopathic vet whom you like and trust. This process takes time and you are likely to encounter symptoms that may alarm you in the return to health. Download this free report to help convert your cat to a balanced, quality, natural diet. Contact me if you would like to discuss how I can help.